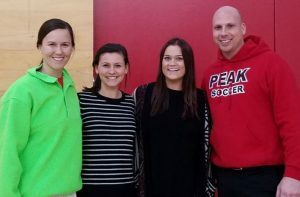 At Uplift Peak Preparatory, a team of four teachers implement the Roadmap to Success program. The Peak teachers share a passion for helping their scholars get to college! The Peak Roadmap team: Maddie Davis, Caroline Harris, Kathlyn Carney, David McLeod. Read on below for their personal interviews and stories of impact from their experience teaching the Roadmap to Success program. Favorite College Memory: Waiting for my name to be called during graduation. To be honest, I didn’t know what I was getting into at the beginning. I was told this would be an ideal profession for me, so I tried it. I am glad someone took a chance on me. Teaching not only gives me a challenge and joy, it also gives me a purpose to get out of bed every morning knowing I can make a positive impact in the minds of our youth every day. I really fell the lesson about interview etiquette is very valuable. Many students had a different perspective on how to dress, how to question, and how to answer questions from this lesson. Favorite College Memory: I remember storming the field at the 2011 Baylor/OU game. That and dancing onstage for Sing are my two favorite memories. I became a teacher because I wanted to be a champion for these kids. I want to cheer them on and help them see their potential. Every one of these kids can be a world-changer once they realize their full value. I love the day that we play the aptitude games. The kids love seeing what they’re strengths are and what potential careers are available to them. Overall it’s a really fun day. What do you enjoy about working with the team at Peak to teach the Roadmap to Success program? Peak is very unique in that we are here for each other whenever we need it. There is a big family atmosphere. It’s a joy and an honor to work with such a dedicated group of individuals. It’s something I hadn’t experienced in the workplace before and it’s refreshing. Favorite College Memory: My sorority’s senior send off. Both of my grandparents were teachers and they have always preached the importance of a good education. I guess their words rubbed off on me, because now I want to instill the importance of school in my scholars. Share a quote you find inspiring: “The time is always right to do what is right” – Martin Luther King, Jr. The resume lesson because I get to share my resume with scholars and talk to them about my own work and college experience. I like our shared passion to help every scholar go to college. A huge shout-out and thank you to our teaching team at Uplift Peak and to all the teachers who tirelessly teach the Roadmap to Success program!